If you’re a winter lover, enjoying the winter sports is one thing to love about the winter. Some may argue that it’s way too cold to spend more than 5 minutes outside, but not everybody knows that, with the right gear, clothing and boots, it’s such a waste to come back inside and not enjoy the cold season. Having cozy and warm clothing is all in vane if you don’t match them with the right snowmobile boots. We all know how cold feet means you’re going to get cold all over the body and you don’t want to come back inside just for that. What to look for when getting snowmobile boots? It’s quite obvious that insulation or aggressive tread patterns are essential for better performance in the snow. We made it easy for you though and you only need to scroll down for the big things. Going shopping for the snowmobile boots may be intimidating if you’re not sure what to look for. Even though you want the boots able to take the long walks, you’re not going to be moving all the time, so you do want them to keep you warm, without adding too much weight. Just to give you a hint, go for 200grams of insulation when you’re not going to do much and don’t settle for anything less than 1000 grams when you’re going in very cold areas, without any intense activity in the plans. Note to self: it’s better to always get removable insulation for even more versatility of your boots. You’re going to be moving on ice and snow so you need boots that can take that. Look for the aggressive tread patters and aggressive outer lugs. You may even get some with metal studs if your adventure is going to happen a lot on ice. The kick plates protect your toes from the impact or help you clean better snow and ice off the sled. Seek that your boots also come with ankle protector and impact plates. Last thing you want to do in the cold is to have to take your gloves off for handling some tiny laces or sophisticated lacing. Always get the large ones, with simple lacing system. Heck, even a strap style system is going to work when out in the cold! 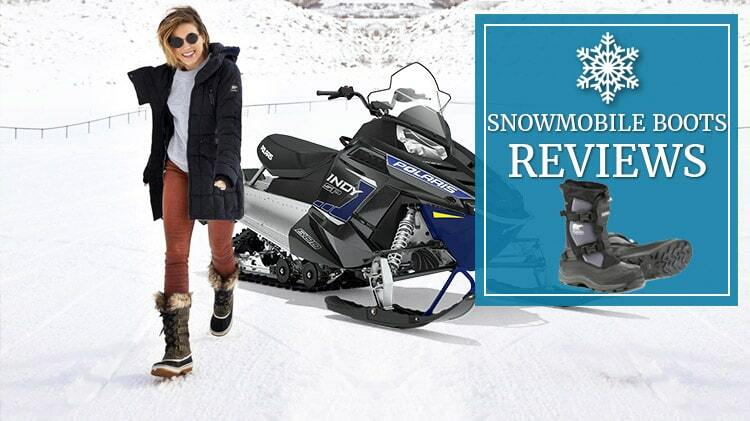 The more time you’re planning to spend outside in the cold, the more you need good, rugged, reliable snowmobile boots. After all, you do want to stay outside as much as you can! 1). Just because you go shopping with a low budget, doesn’t mean you have to go back home empty handed. The Kamik Men’s Greenbay 4 Cold-Weather Boots is a very good example of boots that manage to do a great job during the coldest winter, without having you to pay the extra buck. Proudly made in our USA, the boots are made with textile and present a synthetic sole. They are designed and made to withstand the extreme temperature so if you think you’re up for it, don’t hesitate to wear them on a -40 degrees weather. The boots are waterproof and tall enough so that snow doesn’t come inside. The 600 nylon uppers are flexible and make the boots comfortable and easy to wear. As a matter of fact, the boots are very easy to slip on/off and the rear pull-on loop minimizes your efforts. The list of details is long and includes the lace lock snow collar, the removable Thermal Guard wicking lining, and the self-cleanign PULSE rubber outsole. Therefore, the boots keep you warm, without making your feet sweaty and don’t collect snow. We can’t forget about the drawstring at top line nor the mid-foot adjustable Velcro closure strap that keeps your foot snug and cozy. The traction is efficient on snow and icy surfaces and the thick treaded rubber outsole has a big word on that. Sturdy and well-made, the boots aren’t too heavy and are comfortable enough for hiking as well. Nevertheless, for the good build, waterproofness and reliability in snow and on icy zones, the boots are a definite go for many. 2). 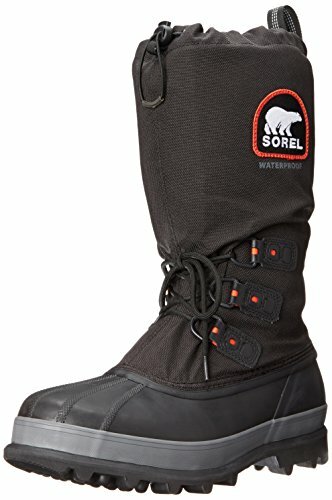 Comfortable and waterproof, the Sorel Men’s Bear Extreme Snow Boots are a nice option to consider whenever in need for the cold season. They’re made with textile and synthetic, but the rugged build makes them so dependable in the snow. As they feature waterproof polyurethane-coated upper, along with drawstring and barrel-lock, you may confidently wear them in the snow all day long and still come back home with dry feet. The boots are also well padded which explains the high comfort. They feature a recycled felt inner boot that is easy to remove. 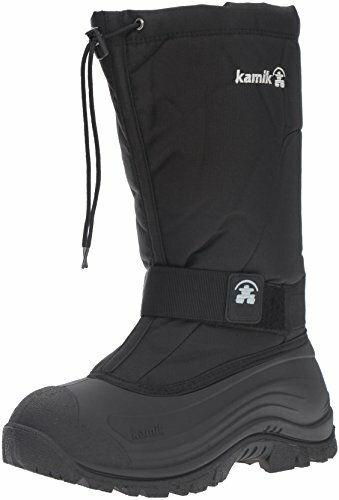 The inner boot comes with omni-heat reflective lining so you can rely on their comfort and warmth. Add the bonded felt frost plug midsole, and you got yourself the boots for the next snowmobile experience. Let’s not forget the handcrafted waterproof vulcanized rubber shell that comes with Sorel aero-track and non-loading outsole. The traction is good and the boots don’t slip on icy terrains. The boots are also waterproof blizzard XT thanks to the lining and take temperatures up to -40 degree. You may feel like having a bit too much extra room, but the boots make a perfect fit for the wide feet. They keep your feet cozy and snug thanks to the efficient lacing. Strong and rugged, yet looking pretty nice, the boots aren’t to miss out when shopping for the next winter. Reliable, waterproof, comfortable, warm and with a good grip. Why stumble in the minor issues? 3). 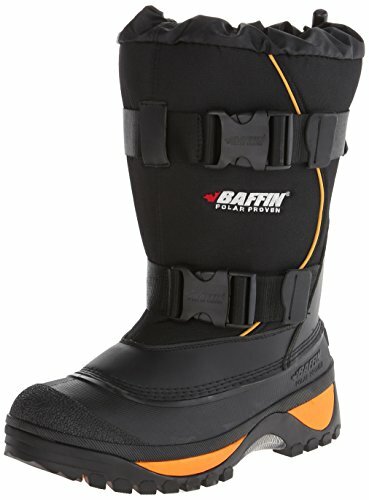 Lightweight and well padded, the Baffin Men’s Wolf Snow Boot are worth to try when you planned some winter fun experiences in the close future. The boots are made with lightweight synthetic recyclable rubber so they keep you warm, letting you move as much as you want. They bend easily at the ankles and feel lightweight, without losing the stability. Actually, they do feel secure on your feet and don’t slide on. They are well padded and come with dual buckle straps around shaft and drawstring collar. Add the tall profile and you got boots that don’t let any snow get inside. 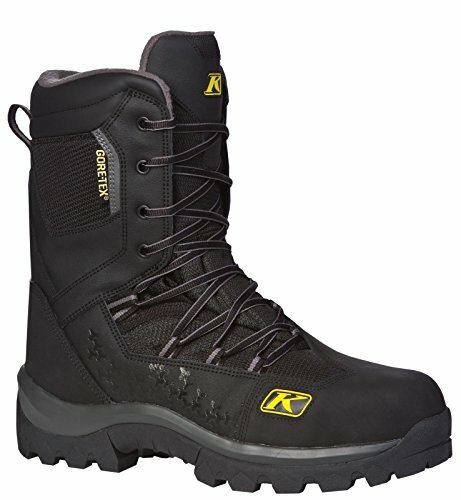 The seven-layer insulated boot system is easy to remove and the boots present an -40 F insulating rating. The included rubber compound outsole ensures great arch support and the boots give good fit and high comfort. The midsole and the sole are molded to the base in a continuous process, which explains the comfort they provide. Another thing we really like is the little yellow detail that makes them easy to notice in the dark. The boots have a good grip and everything about them says high quality. Despite the downsides, the boots are a great choice whenever you’re going to spend a whole day outside, when freezing! 4). Step up your game with some high quality boots that may surprise you on so many levels. 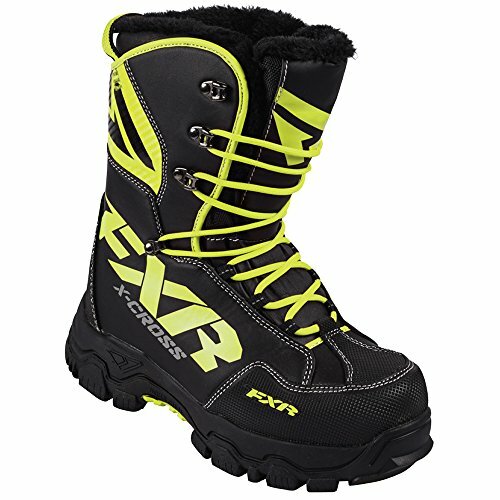 The 2016 FXR Black and Yellow Hi-Visibility Men’s 10 & Women’s 11 X-Cross Snowmobile Winter Boots are a power hours when it comes to snowmobile boots and you only have to scroll down to get a better understanding of this. Let’s start with the ankle lace lock secure system that keeps the boots tight and snug on your foot, without compromising the comfort level. No snow gets inside the boots and your keep stay dry until you get back home. The webbing pull strap is easy to use and the boots remain tight on your feet, no matter how much you’re moving. The BTO Thermostatic midsole insert keeps your feet warm (may be too warm), whereas the FXR high traction outsole sustains effective traction on slippery surfaces and snow. The diamond grid genuine rubber inserts increase comfort and make the long hikes a breeze. Add to the list the fixed fur lining and you start making an idea why the boots make such a great deal. We also have to mention the Toe kick that helps you clean snow and ice easy. The boots are warm and supportive, yet flexible enough for casual and daily use. The tongue present a new design that supports better fit/lace tightening. The high traction outsole help you move nice and easy in the snow or on slippery surfaces. Lightweight, comfortable, warm and looking so nice, the boots are an amazing option to try. All things considered, for the amazing traction, lightweight, warmth and comfort, the boots are dependable in the cold season. 5). Made to keep you dry no matter where you take them, the Klim Adrenaline GTX Snowmobile Boots are one of the best options out there that you could try on the cold season. The boots are made with Gore-Tex technology and you’re never going to have to worry about getting cold or wet feet when using your snowmobile. They come with anchored lace loops for cinch-down power. They remain nice and tight on your boots, yet comfortable for a very long time. The list of good features also includes the licker toe piece that takes wear from tunnel bolts. The board is stiff and long lasting, but it’s efficiently dispersing shock, protecting the bottom of your foot. The boots come with 600 gram thinsulate insulation so they keep you very warm. Despite the thick insulation, they don’t feel bulk, but lightweight and cozy. Don’t worry about having soaking wet socks at the end of the day. The boots present good breathability and keep you warm, without making your feet sweaty. They do come with moisture wicking liner materials, which explains the dry feet at the end of the day. The insole is moisture wicking and easy to remove. The boots run true to size and are very well made. Able to take you wherever you need, mud or snow, the boots aren’t just versatile, but also reliable, warm and with a great traction and stability on all sorts of surfaces. We also appreciate the high-grip outsole that is made to take the long time use. For what is worth, for their waterproofness, warmth, good traction and grip, the boots are a popular option for anyone using the snowmobile.